For a fountain pen lover on a low-cost budget like me, it’s always a delight to receive great deals on cheap pens, or even better, receive pens for free. 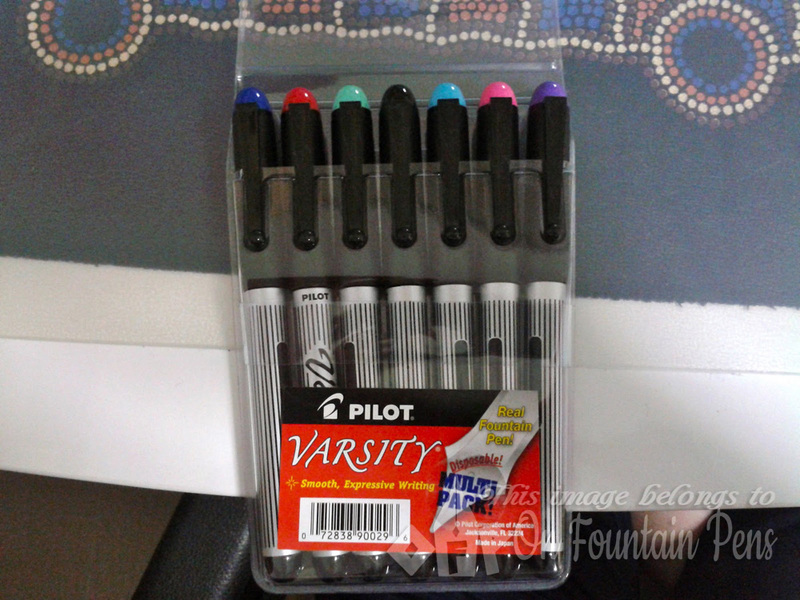 So a few weeks ago, as I was browsing on Amazon for something entirely different for my mum for Christmas, I chanced upon two great deals: a Lamy Vista Demonstrator pen and a multi-pen pack of Pilot Varsity fountain pens. I can’t remember the prices but I checked their original prices elsewhere on the internet, and, including the shipping costs, the pens are about 30% off their usual prices! Felt like I had won the first prize in a lucky draw. 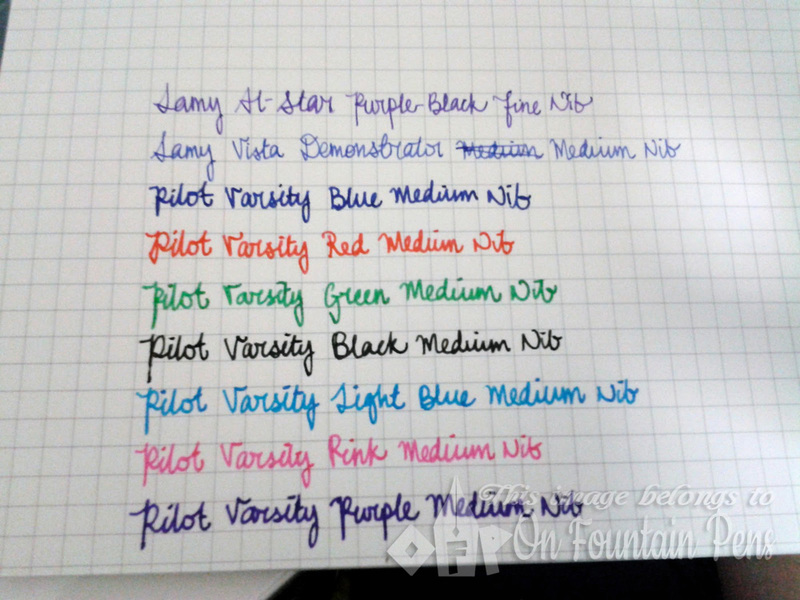 This post will be dedicated to the Varsity pens — more on the Lamy in another post. Firstly, they are fountain pens. Secondly, they come in a variety of colours. Who can resist such a set! After waiting for two weeks without a moment where I wasn’t thinking of the pens I was going to get, I finally received them! I hadn’t checked the nib sizes when I bought them, but when they arrived I saw that they are all medium sized nibs. Which is really cool because so far all the fountain pens I ever had were all fine or extra fine ones. 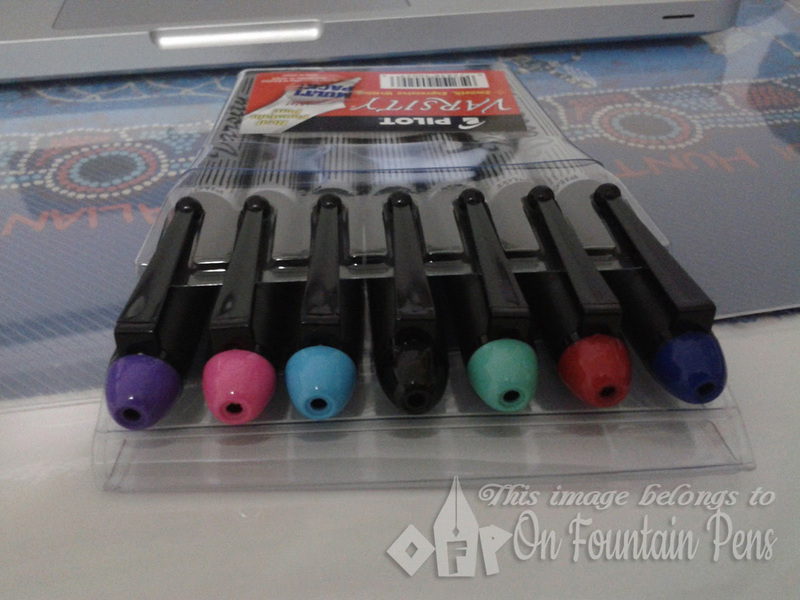 As you can observe, the pens come in seven colours of blue, red, green, black, light blue, pink, and purple. One disappointment I got was they there was no orange coloured one. I never had an orange fountain pen and so far I never seemed to manage to find any orange coloured ink-in-a-bottle which was affordable. I tried writing with them on Daiso squared paper and it was an unspeakably smooth writing experience! I couldn’t really believe that I was writing with a cheap fountain pen. It felt even smoother than my Hero 1382 which I thought was my smoothest pen yet. To confirm my revelation, I took out my Hero and tested it too — and it’s really less smooth than the Pilot! The nib writes with a nice, solid wet line and the colours that flow out are equally solid. The ink colours are bright and cheerful colours, exactly the same as the cap colours, with the exception of the green. It disappointed me slightly that the green wasn’t accurately portrayed on the cap, but then I preferred the green of the ink anyway. Okay, I don’t know how to adjust the colour settings of the picture to portray the accurate shades, but I didn’t bother to do so either because I believe different computers with different colour settings would portray my accurate picture differently too. And apologies for the first two lines with the Lamy pens, they’re not very related but you can compare a fine writing line with the Pilot’s medium one. A third disappointment of mine was dispelled because I thought that this set of disposable pens could never be refilled; other than the cap, there doesn’t seem to be any removable parts. But this website here explains a nice method to refill the pen! All in all, this set of pens is a real steal! 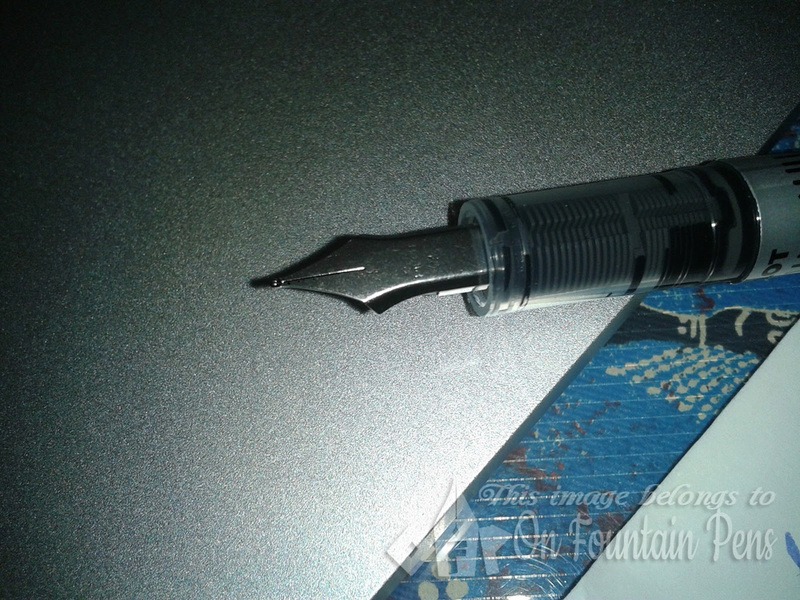 Here's an invitation to join my Facebook group for the Pilot Varsity fountain pen. You'll find like-minded Varsity fans from all over the planet. Come on over! I always wanted to know what these type of fountain pens are called! The flat types! !